← Disaster Relief 2.0: Towards a Multipolar System? 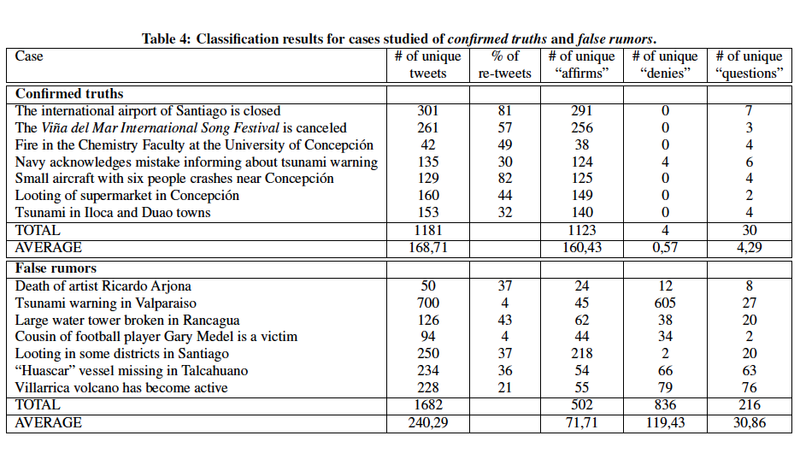 A research team at Yahoo recently completed an empirical study (PDF) on the behavior of Twitter users after the 8.8 magnitude earthquake in Chile. The study was based on 4,727,524 indexed tweets, about 20% of which were replies to other tweets. What is particularly interesting about this study is that the team also analyzed the spread of false rumors and confirmed news that were disseminated on Twitter. The authors “manually selected some relevant cases of valid news items, which were confirmed at some point by reliable sources.” In addition, they “manually selected important cases of baseless rumors which emerged during the crisis (confirmed to be false at some point).” Their goal was to determine whether users interacted differently when faced with valid news vs false rumors. The study shows that about 95% of tweets related to confirmed reports validated that information. In contrast only 0.03% of tweets denied the validity of these true cases. Interestingly, the results also show that “the number of tweets that deny information becomes much larger when the information corresponds to a false rumor.” In fact, about 50% of tweets will deny the validity of false reports. The table below lists the full results. I think these findings are particularly important for projects like *Swift River, which try to validate crowdsourced crisis information in real-time. I would also be interested to see a similar study on tweets around the Haitian earthquake to explore whether this “collaborative filter” dynamic is an emergent phenomena in this complex systems or simply an artifact of something else. This entry was posted in Crowdsourcing, Information Forensics, Social Computing, Social Media and tagged swiftriver, Twitter, validation. Bookmark the permalink. This report suggests that “Truthiness” has some natural buoyancy, that the Truth “floats to the top” on Twitter — and I am really happy to hear this. It’s a fantastic thing that type of noise is dampened by the crowd. This confirms my anecdotal observations. I remember in the Mumbai attacks in 2008 as the first time that Twitter got serious about policing rumors. It would be great to see these results for that data set as well. As we know, an organic rumor could be extremely dangerous, leading for instance to the death of first responders, the expulsion or aid workers, or the neglect of victims. I think about an instance where a rumor, “the aid worker poisoned the wells” would cause someone to get murdered, or provoke a riot. So I am cheered to see that Truth seems to “float more” on Twitter. Swift River is directly addressing this from an external perspective, but something native to Twitter could help prevent rumors, not just spot them. And still we need better information literacy — more than any technological solution. My fear is that even a single high profile failure will damage “the reputation of the crowd” in a way that will have a strong chilling effect on the incredible experimentation and energy that is happening presently. I do not want to look back on this as a lost golden age of crisis mapping — we are only barely getting started! Toward this goal, a close examination of the Chilean dynamics is really valuable — we just need to keep it in perspective as a snapshot of the early heydays. Maybe one day we’ll be able to govern ourselves instead of relying on centralized institutions. What about deliberate obfuscation, which might be salient during political violence mapping?